The Market Oracle reports about Gold Price Manipulation. It saddens me to point out that — collectively - the milestones on the chart above are all indicative or symptomatic of systemic financial collapse. It saddens me even more knowing that the price of gold has acted counter-intuitively — getting hammered — each and every time these unfolding events should have propelled it higher. The table above is excerpted from the Quarterly Derivative Fact Sheet compiled and published by the U.S. Office of the Comptroller of the Currency. It shows that J.P. Morgan Chase has/had roughly 100 billion worth of gold derivatives [predominantly “short” gold futures] on their books as of Sept. 30, 2008. 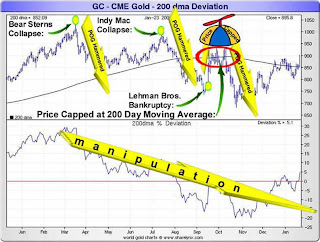 Gold price suppression is not simply a “paper game” where relentless amounts of price suppressive “futures” can be sold forever; the price suppression scheme also requires that the price riggers expend some physical gold too — to make the ponzi-esque selling of futures “believable.” The physical gold which is mobilized to accomplish this is typically sovereign gold that is “leased” from Central Banks. Folks would do well to remember that once physical bullion is no longer available to “back up” the fraudulently derived futures price, the nominal cost of obtaining physical precious metal will skyrocket. My reaction: This article offers a very simple and clear explanation of the government' s gold price manipulation. 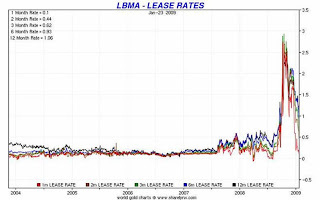 When Americans discover that the fed has leased out all its gold over the years and it has in its vaults is IOUs, there will be panic and fury. The unlucky government officials in charge of this scheme are likely to spend considerable time in jail. For those who still doubt the government' s interference in precious metals, consider what happened last summer with silver prices. Over the span of a few weeks, two commercial banks sold silver futures in excess of all known supplies and caused the price of silver to fall by half. There is no rational profit or business motive to such a move. Either these two commercial banks were displaying monumental stupidity or they were acting on the behalf of the Federal Reserve. For more about the decoupling between physical gold and its suppressed paper price, see the Enormous Significance Of Gold Backwardation. For more on the history of gold price suppression, see Gold Wars-Governments VS Price of Gold. Notice the big plunge in gold at 4AM Eastern time? This fits a predictable pattern: someone regularly unloads a large supply of gold in the thinly-traded off-hours (around 4AM). I have seen it happen a dozen times in the last few months. Considering all the layoffs announcements we have had in the last week, I guess they thought it was time to try and hammer gold again. This entry was posted in Background_Info, Gold, Market_Skepticism. Bookmark the permalink. A good article. Someone recently remarked that March would prove to be the 'tipping point,' whereat the entire globe finally comes to an realization that events in progress are indicating something far worse than previously imagined. Moreover, events are clearly accelerating at an exponential rate. I, myself feel that the bankster charade will come to its inevitable conclusion much sooner than any of us might believe. What fascinates me is how long they think they can so blatantly continue to keep the DOW above 8,000. Apparently, even after every factory, bank and government service is shut down, the DOW will still magically rise an X number of points on any given day that the last million people with an income finally lose their jobs. As the Mighty Mogambo himself might put it: hahahaha! I think it does a good job of explaining why indexes such as the DOW are rather pointless imaginary numbers with no real meaning whatsoever. $124 B in derivatives represents 98% of all gold derivatives in the world. THAT HAS GOT TO BE GROSSLY MANIPULATIVE. WHERE IS THE OVERSIGHT, GODDAMMIT? While ever paper longs on comex fight the paper bullion banks, friends of the Fed, primary broker/dealers, they'll loose. If longs stood for delivery, comex would dry up, CB lease rates would go too high, shorts toasted. Gold moonshot. Gulf states start own currency in Sept/Oct, 2009, probably gold, (maybe partially) backed, given Saudi purchases. China accumulating Gold, Russia too. West sells paper, probably very little physical left. East buys physical, and uses fiat to do it. Tell me, - who are the fuckwits? What fascinates me is how long they think they can so blatantly continue to keep the DOW above 8,000. Yes, I agree. I no longer believe the Dow will fall in terms of dollars, but it will continue to fall in terms of gold. Nice Charts. I added them to Graphs and Visuals of the Economic Crisis.